Perfect for your home or office workstation, the SUPER7B Protect It! 7-Outlet Surge Protector features a surge suppression rating of 2160 joules to defend your sensitive electronic components against strong surges and spikes. The SUPER7B includes full normal mode (H-N) and common mode (N-G/H-G) line surge suppression, as well as technology that filters out disruptive EMI/RFI line noise, preventing interference from disrupting your electronics and inflicting damage or data loss. 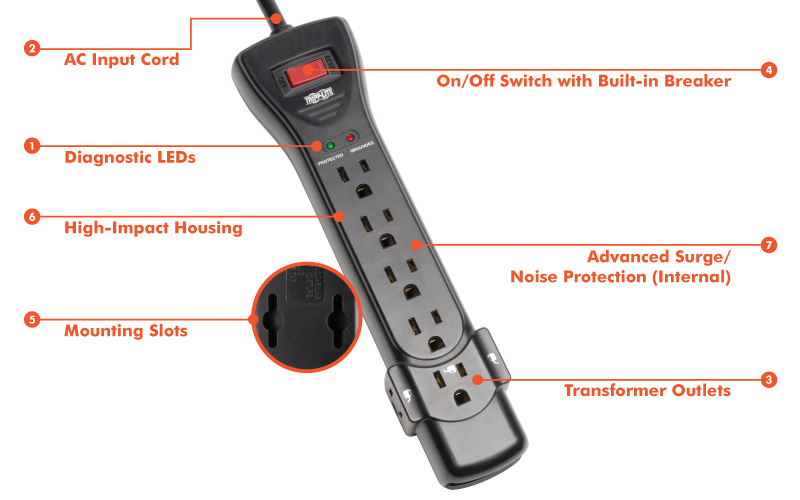 Your computer and peripherals plug into seven NEMA 5-15R outlets. Two outlets are mounted on the side to let the SUPER7B accommodate three bulky transformers without blocking adjacent outlets. Integrated 15-amp circuit breaker protects all outlets against dangerous overloads. On/off switch provides one-touch control over connected equipment. A green LED indicates protection status, while a red LED assures that your wall outlet is properly grounded. The right-angle NEMA 5-15P plug with 7-foot AC power cord allows equipment to be moved flush against the wall to save space in your workstation. Keyhole slots incorporated into the bottom panel provide convenient wall or desk mounting options for the black plastic housing.